When Kant Sheck Dees Bluze (Earwig Records) was released in 1991, it was a return to form for Jimmy Dawkins, and then some. After a great start with Delmark Records in the ’70s, Dawkins’ later work in the ’80s (most of which was only released in Europe) lacked the intensity of his earlier performances for some reason. He opted to start his own record label, Leric, and focused on the business end of the music, bookings, promotions, song publishing, and releasing singles by Chicago artists like Tail Dragger and Nora Jean Wallace, Vance Kelly, and Little Johnny Christian. Though Dawkins was nicknamed “Fast Fingers,” that name didn’t really fit the way he played guitar, which is more of a slashing, stinging style. When you hear him, he’s instantly recognizable. Though he’s often associated with the West Side guitar slingers like Magic Sam and Freddie King, his relentless, muscular sound was more like West Side on steroids. In addition, he has always been a solid songwriter with sometimes brutally honest lyrics, mixing in political and social concerns with songs about his own experiences. Kant Sheck Dees Bluze was energy and intensity from start to finish. With Nora Jean Wallace on vocals, Professor Eddie Lusk on organ, Johnny B. Gayden on bass, Billy Flynn on guitar, and Ray Scott on drums, Dawkins went to Acme Recording Studio in Chicago and knocked this session out in one day. Flynn and Dawkins had worked together regularly since the early ’70s and Flynn was something of a protégé to Dawkins. Each compliments the other well on guitar. On “Gittar Rapp,” they team up for a pretty impressive guitar battle. Flynn also contributes mightily on the nine-minute title track, a minor key masterpiece which also benefits from Lusk’s keyboards. Despite worthy competition, it’s easily the best tune on the album. Other standout tracks include “Wes Cide Bluze,” “Beetin Knockin Ringin” (by now, you might have noticed that Dawkins likes to alter the spelling of the titles on his songs), and “Luv Somebody.” “Gotta Hold On” is a gospel-flavored number that provides a nice change of pace to the non-stop intensity of the earlier tracks. Wallace sings lead on two tracks, “A Love Like That” and “My Man Loves Me.” To be honest, Ms. Wallace is a good singer, but she’s just not my cup of tea. However, the musicians do a fine job on these tracks, notably Lusk and Gayden. 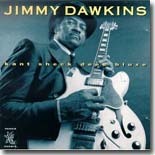 Kant Sheck Dees Bluze marked a return to form for Jimmy Dawkins. He returned a couple of years later to record several discs with the Wild Dog subsidiary of Ichiban Records in the mid ’90s, then a pair for Fedora Records in the early 2000s. Though the guitar playing continued to be amazing, the later recordings featured fewer original compositions from Dawkins. Kant Sheck Dees Bluze ranks as one of his best recordings (just below his Delmark debut, Fast Fingers), and is certainly his most personal recording.